One of the most overlooked measures of smartphone performance is the speed of the storage. No matter how fast the processor, when the storage is too slow you get a laggy, stuttering experience. But this real-world fact is ignored by benchmarks that only measure peak CPU performance in isolation. That's why our PCMark for Android benchmark uses everyday tasks that test the device as a whole unit, including its storage. And now we're taking it a step further by adding a new, dedicated test that provides a comprehensive view of Android storage performance. A device's IO performance describes its ability to write data In and read data Out of the storage. Good IO performance is key to a smooth, stutter-free experience. The PCMark for Android Storage Test measures storage IO performance in three key areas. Internal Storage is where your apps save private data such as settings and user data. The Android default cache directory is also in the internal storage. Files saved in internal storage are private to the application and cannot be accessed by the user or other applications. Internal storage performance most commonly impacts the startup time and smooth running of your apps. External Storage is used to save public data such as documents, photos, videos, and other files, as well as non-sensitive app data such as textures and sounds. Depending on the device, external storage can be removable, (such as an SD card), or built-in. Files in external storage can be found and modified by the user. External Storage performance most commonly impacts your experience when loading and viewing media files such as photos and videos. Both tests measure the performance of the storage for random read, sequential read, random write, and sequential write operations. You get detailed scores for each part of the test as well as an overall, weighted score that you can use to compare devices easily. 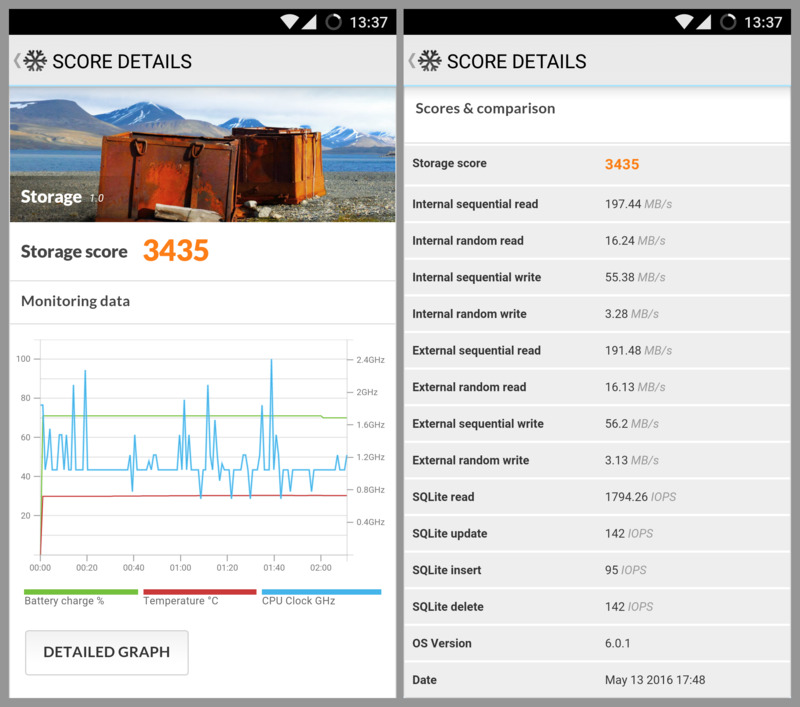 Benchmark the storage performance of your Android device with the new Storage test. Restored the language option on the Settings screen. Choose from English, Chinese, and Russian. App now requires Android 5.0 or higher.